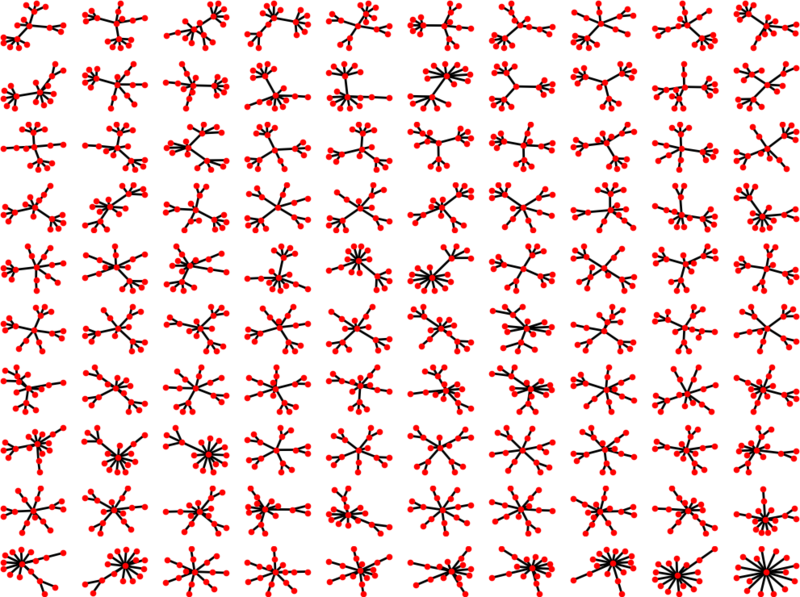 I want to visualize all unlabeled trees with \$n\$ or fewer nodes, not just count them. First idea/attempt: Take a list of all \$n-1\$ node trees, then append a new leaf to every tree in every way to get a new list of \$n\$ node trees. Clearly, this new list will contain a lot of isomorphic duplicates. To fix this, we start adding the \$n\$ trees to a new list, and doing so only if they are not isomorphic to any of the trees in the new list. Since graph isomorphism problem is not known to be solvable in polynomial time, this makes the entire process even more horrible performance wise, because this process will do a lot of such checks. My question is if this can be done more efficiently, or in a better way?
""" trees of order N or less will be generated """
""" return copy of graph with newNode node appended to toNode node """
""" get all n+1 node cases out of all n node cases in prevTreeList """
""" one node case """
""" new loads of n+1 graphs by all possible list appendations """
""" this will include loads of isomprhic duplicates... """
""" remove isomorphic duplicates """
""" it will check every graph to be added with all added graphs for isomorphism... """
""" print the number of examples to check if the code is working properly """
""" draw and save the plots """
"""Return a copy of graph with newNode appended to toNode.""" Return a copy of graph with newNode appended to toNode. Also, some integrated development environments (for example, PyCharm) can read and interpret docstrings to provide context-sensitive help or to generate reference documentation. And the built-in doctest module can automatically run examples in docstrings. but networkx has the function trivial_graph which does something similar. case a list containing the trivial graph is returned. so I would drop the special case. It is easy enough for the caller to pass the list containing the trivial graph, if that's what's wanted. new node to any of the nodes in any of the graphs in the argument. Instead of having a flag isomorphic to determine whether the new graph has been found to be a duplicate, use Python's for ... else: ... statement, or the any or all functions. There's no need to use networkx.algorithms.isomorphism.GraphMatcher: you could just call networkx.algorithms.isomorphism.is_isomorphic directly. """Return list of free trees with up to n vertices.""" Robert Alan Wrights, Bruce Richmond, Andrew Odlyzko and Brendan D. Mckay (1986). “Constant time generation of free trees”. SIAM J. Comput. 15:2, pp. 540–548. Not the answer you're looking for? Browse other questions tagged python performance tree mathematics data-visualization or ask your own question.